07 DRIVE BY - When prejudice rears its ugly head at Bret and Jemaine, Dave shows them how to stand up for themselves. 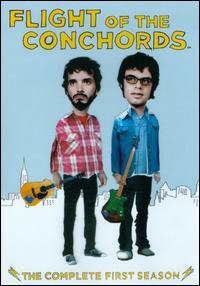 08 GIRLFRIENDS - Bret and Jemaine try dating a pair of friends. Meanwhile, Murray thinks he's made a connection to the record industry. 09 WHAT GOES ON TOUR - The band goes on tour, but a wild stay in a hotel leads to trouble. 10 NEW FANS - The band expands their fanbase to three, much to the chagrin of Mel. So excellent. Deadpan but laugh out loud to the extreme.